These are some of the best Tumblr styles WordPress Themes. This collection involves both free and premium Tumblr style theme. They have been collected from some of the renowned designers. They are some of great tumbler style themes for wordpress blog or websites. These WordPress themes for Tumblr are all responsive – looks great and neat in any mobile device. You can easily download these Free Tumblog WordPress Themes and see if any one of these meets your needs. I have tried to collect some theme with minimalistic designs with all the common features. Crates is from Artexor, a great looking tumblr style wordpress theme that is available to download for free. 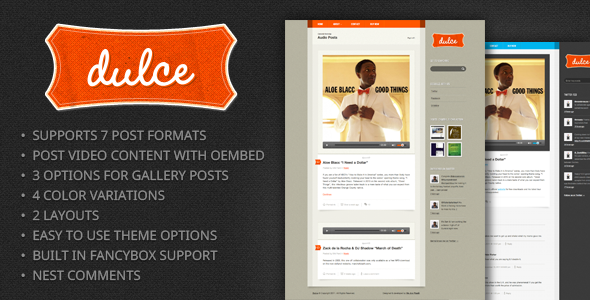 Crates is a super responsive tumblog wp theme. Crates is a grid based layout with an optional two column blog layout which makes it great for any types of bloggers and photographers. Nova Lite Nova is a responsive and neat free Tumblog WordPress Theme, created based on Bootstrap framework. Nova Lite wp theme supports all modern browsers like Chrome, Firefox, Opera, Safari and Internet Explorer 8-10 and uses the cutting edge technologies like Html5 and Css3. Nova Lite offers 6 different post formats and is Sidebar widget ready. SuevaFree is another nice Tumblog wordpress template from alexvtn released in 2014. SuevaFree tumblr style theme is all modern browser compatible and have a great style inspired by tumblr. SuevaFree’s responsive layout makes it possible to show wordpress sites in any device without a single problem. Anew is a classic tumblog style free tumblr theme for wordpress blogs. The Anew tumblr theme is Fully featured with a responsive layout and high resolution design. Anew confirms your content showcasing variety with 10 different post formats shown in great and unique ways. Lingonberry is A clean simplistic and super responsive wordpress tumblr themes for Personal bloggers who are searching for a tumblr flavor. Lingonberry features responsive layout with all sorts of retina ready assets. Lingonberry comes with custom styling for different post formats, highly custom page templates and many customizable widgets for video, Dribbble and Flickr etc. 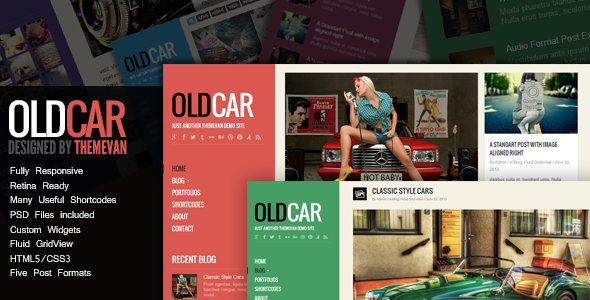 These set include some of the great Premium Tumblr style wordpress theme. You have to pay a certain amount of money for you to use them.All of these Tumblr themes are responsive meaning that you can adjust them to suit your particular needs. These can be used in any devices, from mobile phones to desktops. 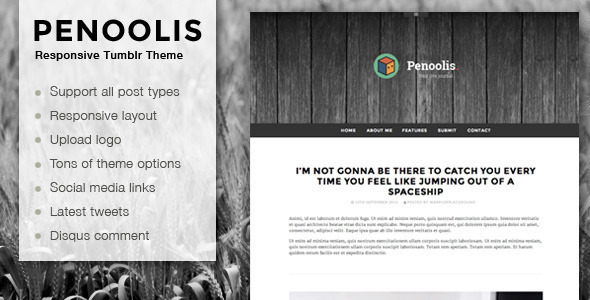 1.Penoolis – Responsive Tumblr Blog Themes. The Tumblr theme has been designed for bloggers and writers who have a preference for a simple, clean and spacious layout. It places focus on the most important content of your blog. Some of the features included in this theme includes: AJAX pagination ,light box on photoset post type ,Disqus comment support ,Support all Tumblr post types ,Disqua comment support ,Google Analytics integration ,upload custom logo and header background among others. This theme has been designed by Envanto elite author ThemeWarriors. This theme has been specifically designed to increase versatility in Tumblr wordpress themes. It supports seven different post formats. It has four color variation and three options for gallery post. This provides you ease in using these themes options. It also features a custom designed audio player. This theme is meant for someone interested in offering readers a smart-looking, stylish, user-friendly and creative driven blog. This theme features: support for 7 post formats including: links, audio, video, images, status, quotes and gallery. The main menu supports drop down 2 levels deep, it supports four widget with ready sidebars, has a built in pagination, editor style for post and pages among other creative features. This theme has been designed by Envanto elite author designcrumbstoo. It has a smart-looking and user friendly interface. It is a premium wordpress theme which has been designed for personal and professional micro bloggers. This theme supports video and image post format. It offers unlimited color variation while providing an easy and intuitive to use this themes option. This theme is best suited if you want to give your readers a user-friendly, smart-looking, stylish, intuitive and creative driven blog. It is very suitable to share your content in a unique manner. This theme is 100% responsive and it is fully scalable. Some of its additional features includes: clean and minimal layout, built bootstrap 3.2, full control over the slide bar, 4 kind of layout for the footer, simple and easy to use theme option, impressive support among others. It has been designed by IITuoWebmaster in wordpress. It is a soft-grunge theme is best suited for designers and artists. It has lots of options and gives you the ability to customize it by yourself and get the blog which you long for. Some of the features of this theme includes: responsive layout ,change photo navigation, alter color on the theme ,documentation ,like button embedded in all the post ,make it blog or grid ,contains a dozen of options which makes it easy to customize you blog. These include customizing space, color, and image placement among other. This theme is compatible with Safari, Chrome, Firefox, Opera and Internet Explorer. This theme has been designed by Yongjutheme. Designed as parenting and Tumblelog theme which has to offer a quirky and colorful design. Some of the features of this theme will include: one-column layout- features a content carousel which supports all post format. These include your own header image among others. It has an optimal layout which can be supported on different media devices. It supports all post formats, has featured images, allows you to connect to various social media site, has a search form on top,and has three widget area- one on each side of the content. This theme has been designed by Automatic in WordPress. It consist of a fully responsive one column blog theme which can support 8 post formats. These includes video, images, audio, chat, quote, link and gallery. It has been designed to be convenient for not only photographers but everyone who enjoys and loves blogging. It has minimal design, Serendity, great color and also typography use on your blog. This will provide you with a high readability to your visitors. They also have the ability to reach your blog by use of different devices. Some of the additional features of this theme include: unlimited color, 7 font options for body copy ,short code generation ,one column blog ,fully responsive design ,jQuery enhanced ,clean and elegant design among other features. This theme has been designed by Envanto elite author elemis. This theme is very suitable for personal blogs and also portfolios. This theme has two layouts for blog, this include a normal layout and a fluid grid view. You can easily change the color of the background with lots of custom options available. This theme also provides you with 5 styling for the wordpress post format. The most important feature is that there are lots of useful short codes which are readily available. The home page can only show recent post but you have the ability to make a different home page by use of the short codes. You have links to support forum and also social networking site. This them has been designed by Envato elite author Themevan. The above list includes some of the best Tumblr style. They have been collected from creative market and also Envanto. They are suited for different uses though most of them can be adjusted to fit certain specific use. WordPress themes are closely associated with Tumblr though they don’t have all features of Tumblr theme they have most of them.